The air velocity range of sensors has been specially optimised for non-aggressive gaseous mediums. The measuring head can be positioned within the duct in any direction. 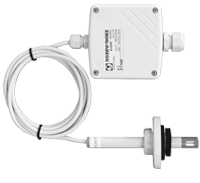 Velocity sensor is available in as 2 options; with a Ø12 x 200mm adjustable extension and with a 2 metre sensor cable. Very high measuring accuracy from 0.15m/s. Output of 0 - 10V or 4 - 20mA, proportionally over the respective measuring range. Requires 24V supply from control unit. Measuring range and response time can be selected by altering the jumper settings.